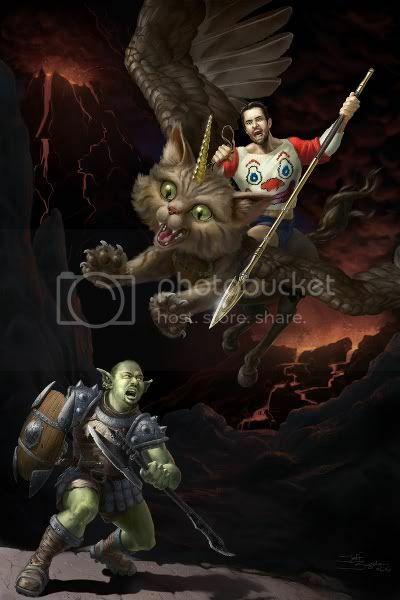 A couple months ago I wrote a 2000 word short story for a contest, the object of which was to describe what was happening in the above "fanart" showing writer John Scalzi as an orc and writer/actor Wil Wheaton riding a unicorn pegasus kitten (I named it Purrgasus!). The results were announced today and, big surprise, I didn't win. I don't feel too bad about it since it's my first short story and there were over 300 others entered in the contest. Since there's no chance that my story will ever be published I thought that I would post it here. Enjoy! Somewhere on Mount Fail, late morning. “Is someone making bacon?” The lone Scalzi orc gave several sniffs and abruptly abandoned his pursuit of the Evil One to search the human soldiers’ camp for any sign of the savory meat. He paid no heed to the gagging sounds the soldiers made when he passed into their sight, nor to the Evil One and his feline monstrosity, who were rapidly making their escape. The captain of the soldiers groaned and hid his eyes from the green-skinned orc, lest he be sick again. How could he have been foolish enough to let the Evil One go? He even cheered for him as he flew away! Vainly he tried to rally his company. “Prepare another net! Bring him back down!” he ordered. The soldiers pulled themselves up and gave it their best but it was far too late. In the end, they could only watch helplessly as the Purrgasus and the Evil One disappeared into the distance. Mount Fail spewed its ash and cinders over the burning land for miles and filled the sky with stinking clouds of sulfur and ash. Below all this, in a slight hollow halfway down the volcano’s side, hid six dirty and weary soldiers. They had camped there for days now, holding their heads low and covering themselves with fireproof cloaks to guard against the flaming debris that floated down from the volcano’s mouth. It paid to be cautious on Mount Fail. Only that morning the seventh member of their company had rushed to be first in line for breakfast and neglected his protective cloak. The sight of his crimson uniform bursting into flames would give his fellow soldiers nightmares for years to come. Their captain flicked away a small pile of accumulated ash from his cloak. “Not long now, eh lieutenant?” he said to the fresh-faced young man crouched next to him. “Oh come now! Have I ever led you wrong?” replied the captain. “The Evil One will come and we will capture him, I give you my word! As I always say, ‘He who is on the side of rightness…should watch out for his left!’” The captain laughed and clapped the lieutenant on the shoulder. The younger man spent a moment trying to understand the captain’s proverb before deciding that it was impossible. “Something’s coming!” the lookout called from her position near the top of the hollow. She pointed to a creature emerging from the ring of smog that hugged the peak of Mount Fail. With a single deadly horn, two foul brown wings and a mouth crammed with cruel, needle-sharp teeth the legendary Purrgasus was unmistakable. On its back was a rider – the Evil One. The soldiers flung out the net and trapped the Purrgasus and its rider, pulling the struggling pair down to earth. The lieutenant and the lookout dragged the man out of the net while the others rushed to lash the hideous feline creature to the ground. Though it mewed pitifully, the captain was not moved. He knew that if given half a chance the Purrgasus would gleefully disembowel him. Ignoring the creature, he turned to the human prisoner. “Let me go!” cried the bestubbled man, struggling against his captors as they removed a golden spear from his hands. Once the shining weapon was freed they passed it to the captain, who examined it briefly before responding to the prisoner’s plea. “I think not, my friend,” the captain said. “The Traykee Purity Guardians will pay us a pretty penny when we deliver your head to them!” He poked the golden spear at the man’s neck. The captain narrowed his eyes at the man and asked, “An orc? Do you take me for a fool?” He spat in disgust and pressed the spear tightly against the prisoner’s neck, causing the man to gasp. The captain pondered the prisoner’s story. Enchanted garments did seem to be packed with multiple magic powers these days. Why, just a few weeks ago he had come across the Mystical Mittens of Mott, which not only made the wearer invisible but also protected their fingers from frostbite. Perhaps the prisoner was telling the truth after all. He lowered the spear and the man gave a sign of relief. “But why?” the lieutenant asked. “Sir?” The lieutenant was bewildered. “Don’t ask questions, just do as I say!” The lieutenant scurried away and returned several moments later carrying a platter filled to the brim with crispy, greasy bacon. The captain took it from him. “Watch and you’ll see why I’m the one in charge here.” He stepped forward and offered the platter to the prisoner, saying, “Here friend, you must be—” but before he could add ‘hungry,’ the platter had been snatched from his hands and the prisoner was quickly devouring every last crackle. The captain gave a satisfied smirk. “You see?” he asked the lieutenant. “Don’t be ridiculous,” the captain replied, watching the prisoner greedily lick the platter clean of grease. “Nobody’s that good.” He turned to the soldiers guarding the Purrgasus. “Cut it loose,” he commanded. To the prisoner he said, “I am deeply sorry for the misunderstanding, John of the Scalzis. You are clearly telling the truth and are free to go. We too wish to see the end of the Evil One, so may the gods shower good fortune upon you and your noble quest!” The captain held out the golden spear. The man took it and replied, “Thank you, friend.” He mounted his feline steed and raised the spear in a salute. “I shall not fail!” At that, the Purrgasus beat its wings and the pair rose up into the burning sky. “A cheer for the heroic orc!” the captain shouted and led the soldiers in a passionate “Hip, hip, hurrah!” They were so intent on their celebration that not one of them noticed when a real Scalzi orc appeared at the top of the hollow, wheezing and snorting in exhaustion from his run down the side of the volcano. “Hey! Stop that guy!” the orc gasped between breaths. “Don’t let him get away!” Startled, the soldiers turned to look at the newcomer. That was a grave mistake, however, because the orc was wearing no shirt. Upon beholding that repulsive sight every last man and woman retched, heaving up the contents of their stomachs until the entire company lay weak and dazed on the ground. The captain struggled to his feet but fell again when he caught another eyeful of the Scalzi orc’s chest. “In the name of all that is sacred, clothe yourself!” he cried.